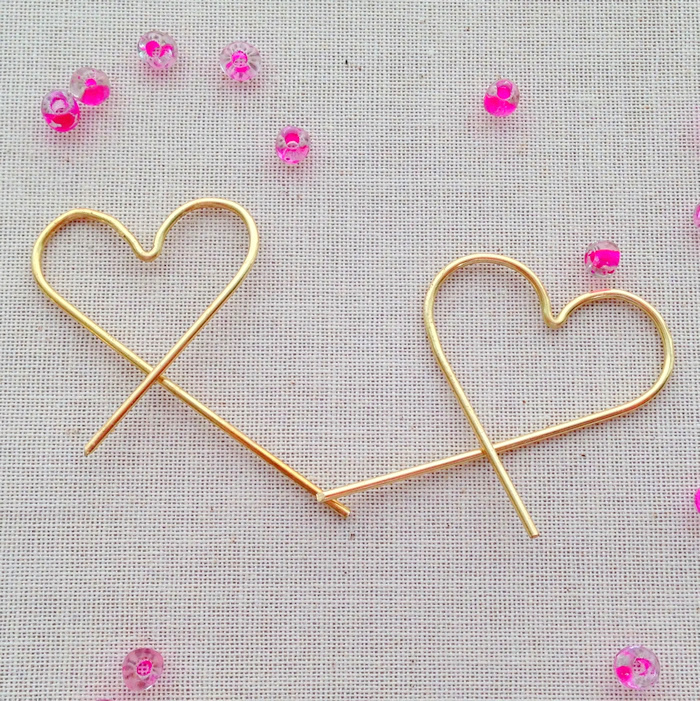 I think I'm Ms. Smarty Pants because I figured out how to make multiple heart shaped wire frames at once. And then, guess what? I met my match... And it's name is brass. 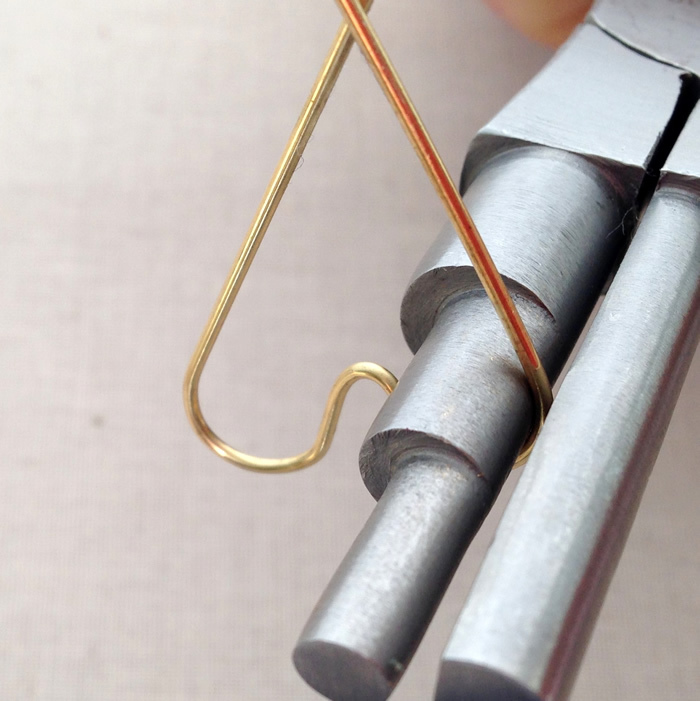 I guess you should be able to figure out that brass is pretty hard when they make implements designed to hurt people, like brass knuckles, from it. 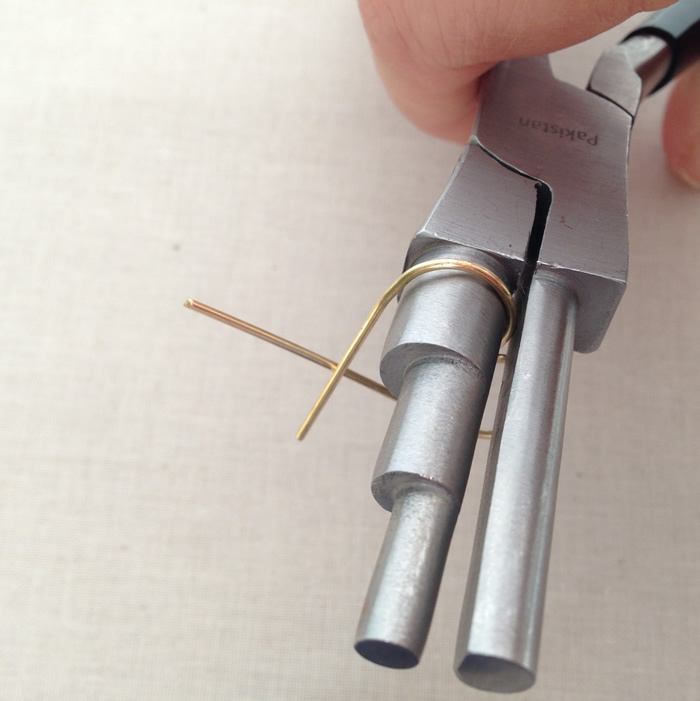 So, when I tried to bend 4 pieces of 18g brass wire just like I did with the 18g copper wire - do you know what I got? Depressed - lol. 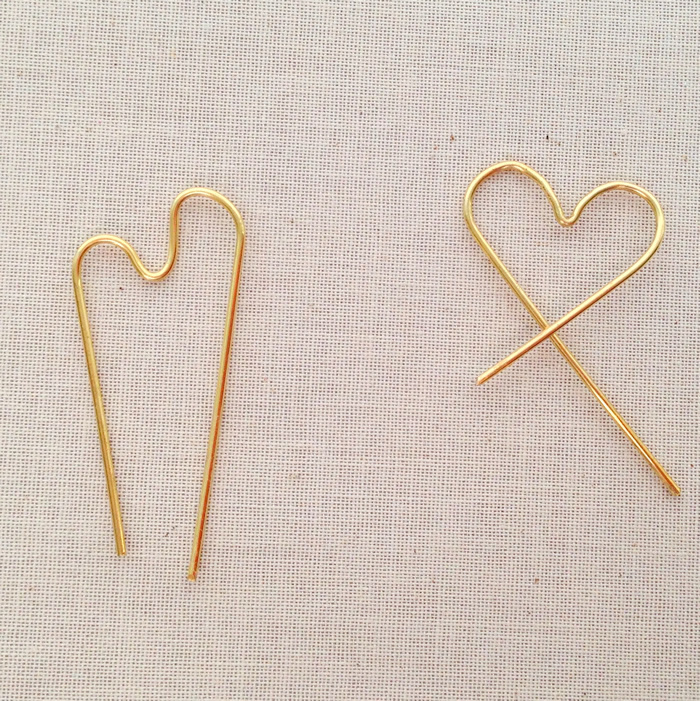 Actually - I got four pieces of wire that look like the left side of the picture, when what I wanted is four nice shapely hearts like the one on the right. 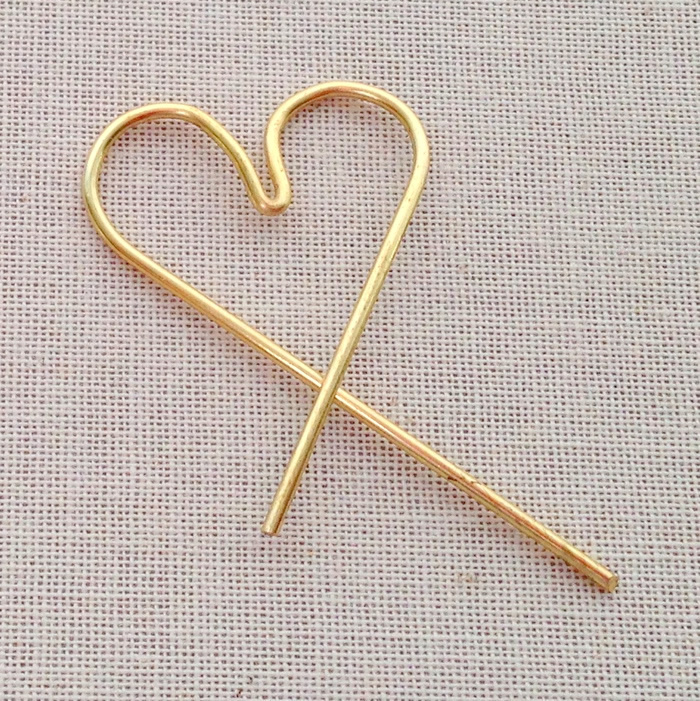 First, I switch to make hearts with 20g brass wire (instead of 18g) and what I know works (like the 18g copper wire). Yay, all is right with the world again! 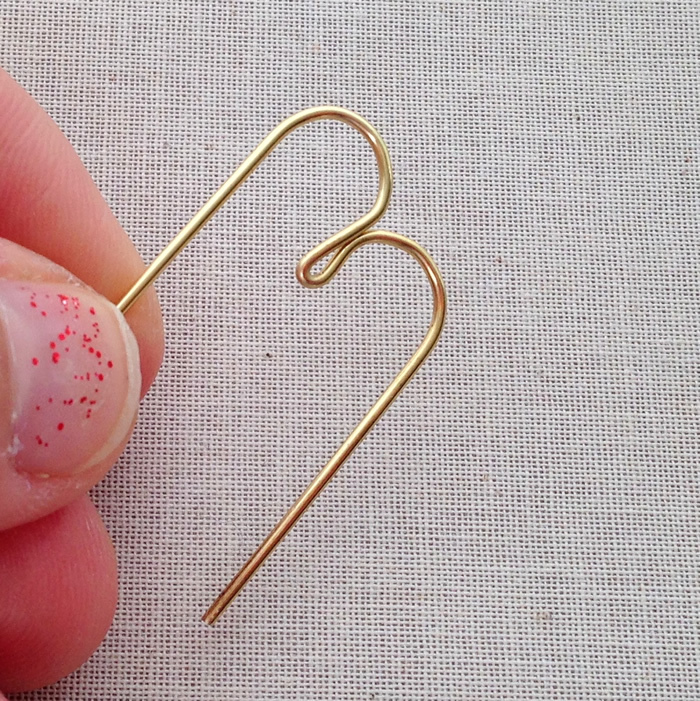 For your notes (if you keep any), brass wire is harder in temper than copper wire. 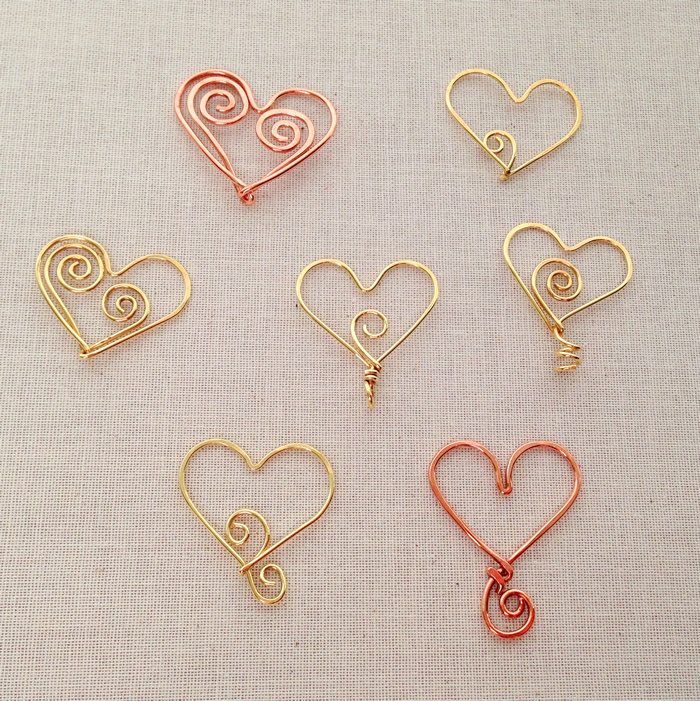 Copper wire is relatively soft and is a great practice wire for people who plan to use soft sterling silver because they bend and shape very similarly. In this case, to get results with brass similar to the result I was having with copper, I just used a slightly thinner wire (20g instead of 18g). Using the thinner wire, I was able to make multiple frames at once using the same technique. After letting things sit for a night or two, I decided to see if I could bring these wire frames back into heart shape. 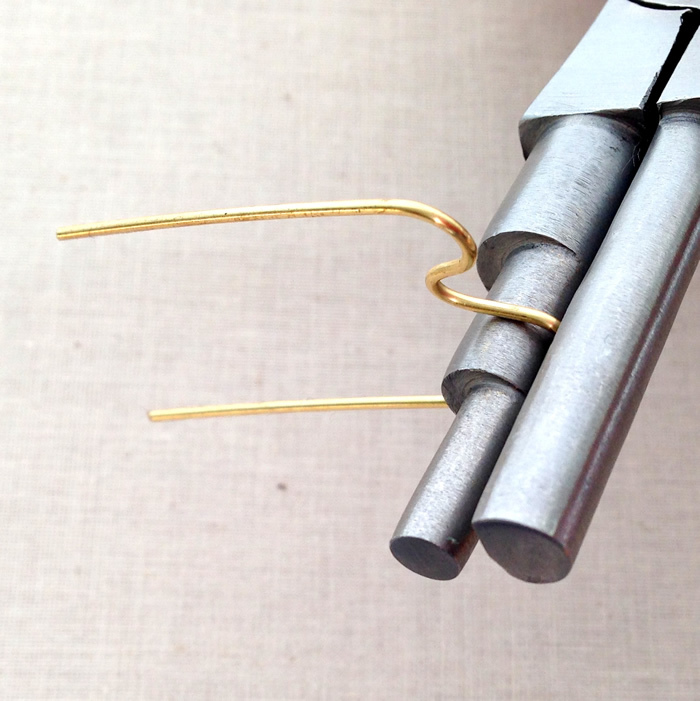 I start by re-shaping the top arcs of the heart using the middle barrel from my step pliers. 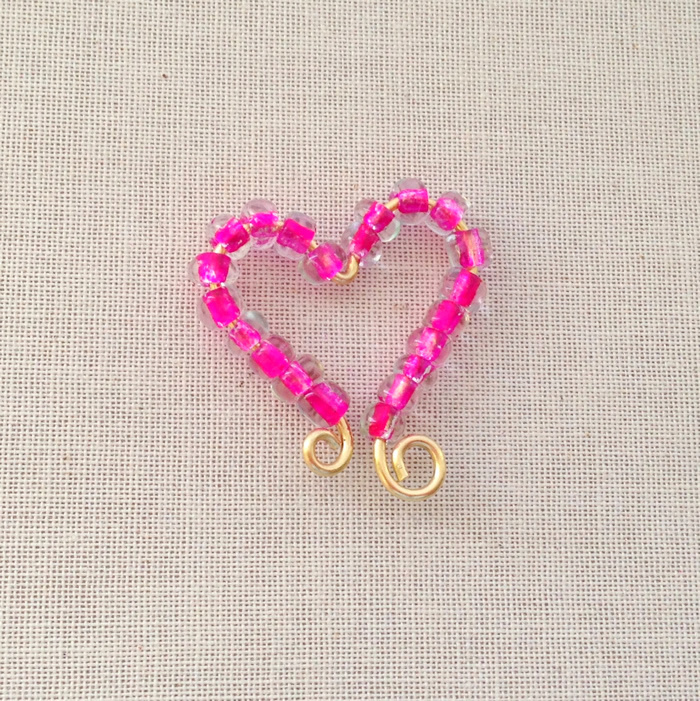 If you'd like to make some heart frames, you can start fresh with this free tutorial to make a wire heart frame for beading. I'm not seeing much of a difference yet. But I keep at it and re-round the second arc using the same method. I can see some improvement - but I really want a nice rounded, fairly symmetrical heart. 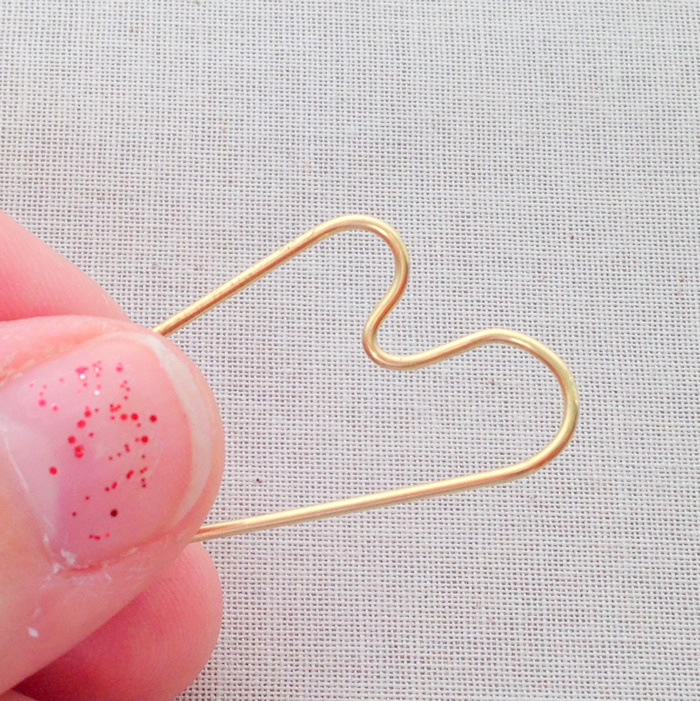 I pinch the center of the heart using the flat nose pliers. And go back to rounding. I am starting to see results - and it's only taken me a minute or two to get to this point. I probably could have accepted this as an end result, but since this wire was destined for the scrap pile just a few minutes earlier, I decided to push my luck some more. 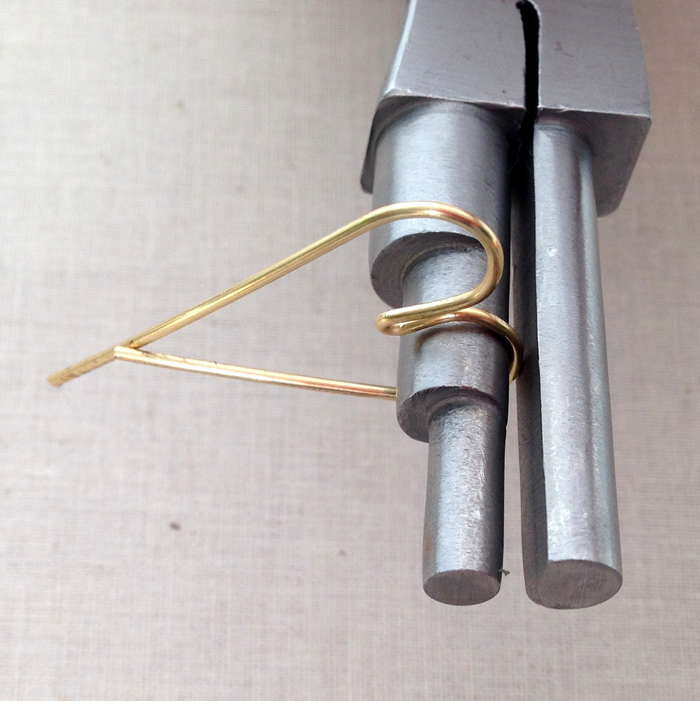 This time, I re-shaped the wire with the larger barrel of the step pliers. It's almost always easier to make things bigger than smaller in the world of wire work. And the heart on the right is the final result of my tweaking. Yay! And now to spiff up the frame with some beads. These are inexpensive glass beads, but I like that they are color lined in the center. 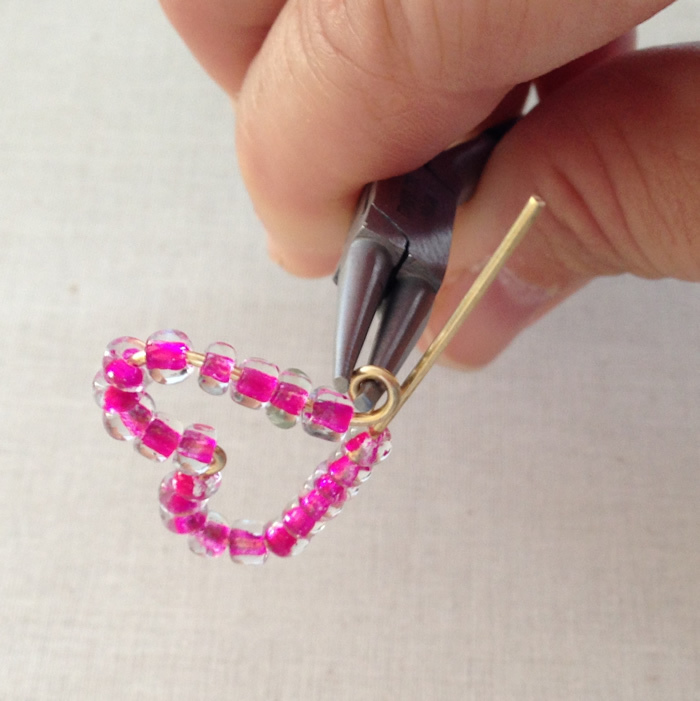 Add a swirl to hold on the beads on the shorter side. The short side was probably just under 1/2 inch. Notice that the bottom of the curl is pushing against the glass bead to keep the beads pushed up tight in the frame and secure? Repeat the process on the other side, also pressing the wire curl against the bead. The larger curl was made from a piece of wire that I trimmed to 3/4 inch. You can adjust the size of the swirls larger or smaller by starting with a longer piece or wire and then trimming the size of the wire tail. I added a jump ring on each side of the heart and connected a simple gold chain. All done! 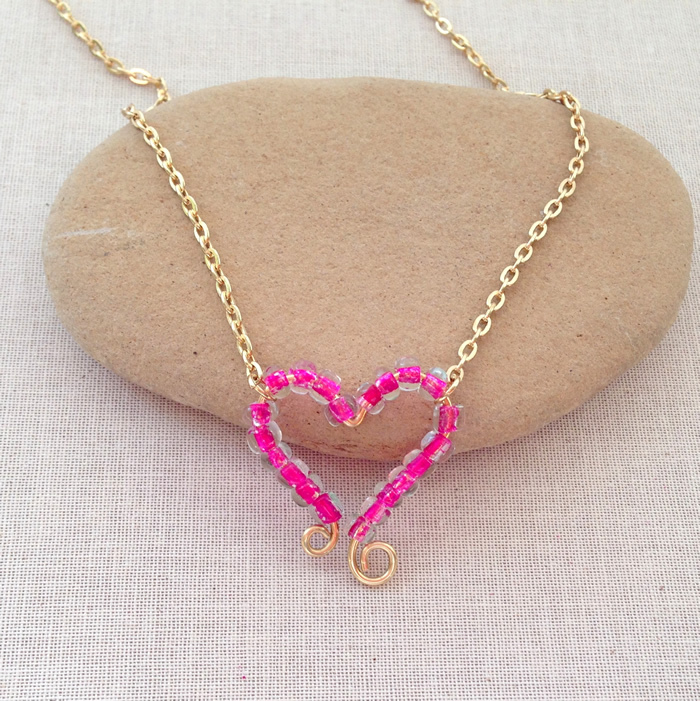 I made this heart necklace for a friend of mine who is a breast cancer survivor. I know she'll like the bright pink - and even though she already knows I love her and adore our friendship, the heart is a great reminder. 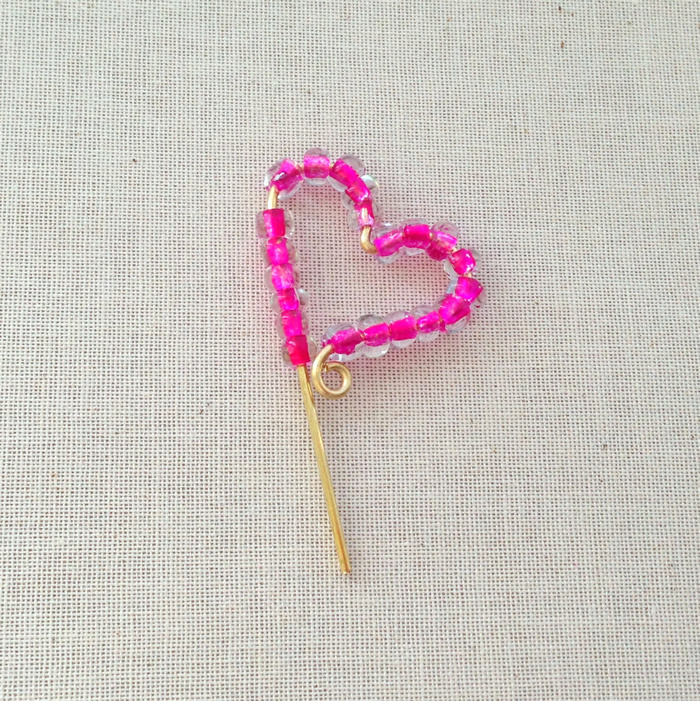 Here are some related posts on how to make and decorate hearts. 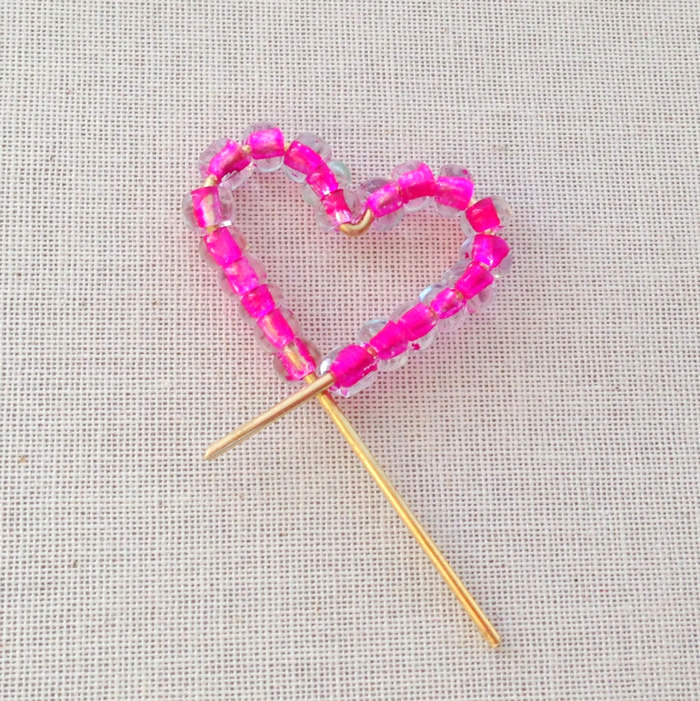 If you've made any hearts following my tutorials, I'd love to know in the comments. What a sweet heart pendant Lisa, thank you for sharing how you made it too. I used to do a lot of wire sculpting and so did my daughter, I have just got back into a bit of wire work recently. 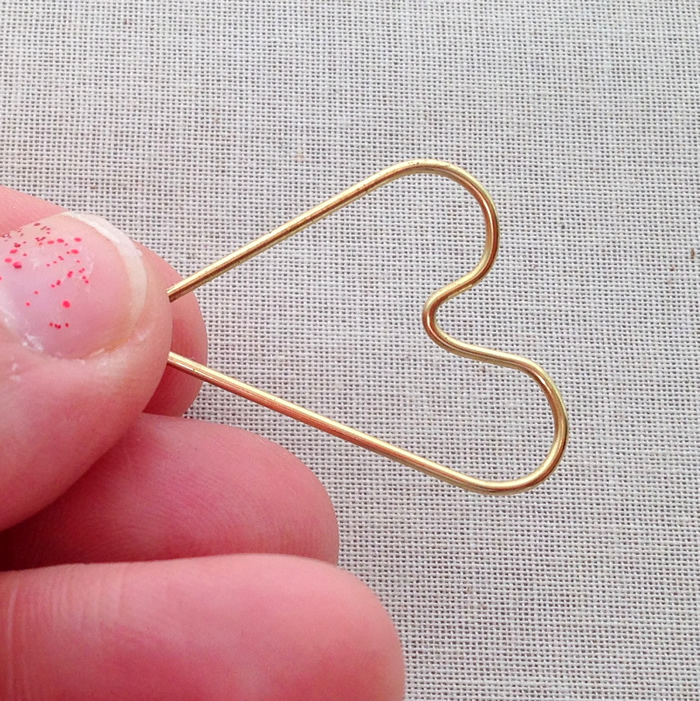 What a cute idea/pendant. I love it. I am self taught and love your work. Will give this a try. Wish me luck:) Thanks for sharing!